In the previous article, The U.S. Is Still The Global Natural Gas King, I highlighted the rise of the United States as the world’s leading natural gas superpower. But it is easy to forget the view of the U.S. natural gas markets circa 2005. At that time, U.S. natural gas production had begun to decline. Natural gas spot prices regularly spiked above $10 per million British thermal units (MMBtu), and sometimes as high as $15/MMBtu. Henry Hub natural gas spot price. 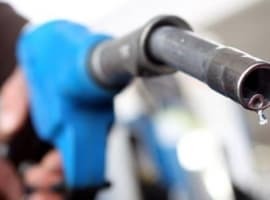 The late Matt Simmons predicted in 2003 that with “certainty,” by 2005 the US would embark on a long-term natural gas crisis for which the only solution was “to pray.” T. Boone Pickens and a number of high-profile energy insiders concurred. ConocoPhillips and ExxonMobil made large acquisitions of natural gas companies, betting on a future with much higher natural gas prices. Liquefied natural gas (LNG) import terminals were built to help address the expected supply shortfall. Of course, that didn’t happen. 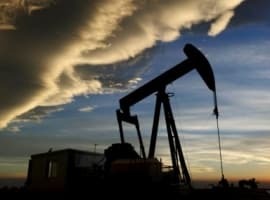 Natural gas production rose sharply as a result of advances in hydraulic fracturing and horizontal drilling, and that kept prices under control. Natural gas spot prices fell below $10/MMBtu in 2008, and since 2010 have rarely been above $5/MMBtu. Working natural gas in underground storage. In the case of a mild winter as in 2012, inventories may not be significantly depleted before they begin to rebuild. In fact, the winter of 2011-2012 failed to pull gas inventories below 2 trillion cubic feet (Tcf) for the first time in over 20 years. Inventories in 2012 bottomed out in early March above 2 Tcf, which was also two to four weeks earlier than is typical. 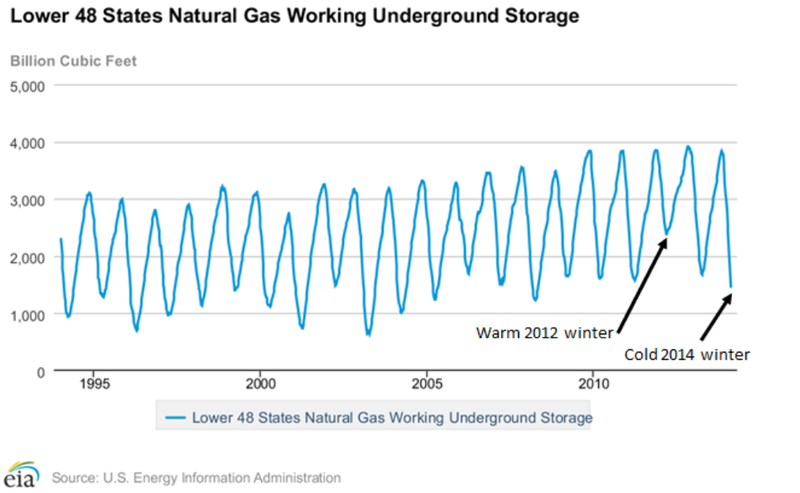 Seasonal natural gas storage levels. 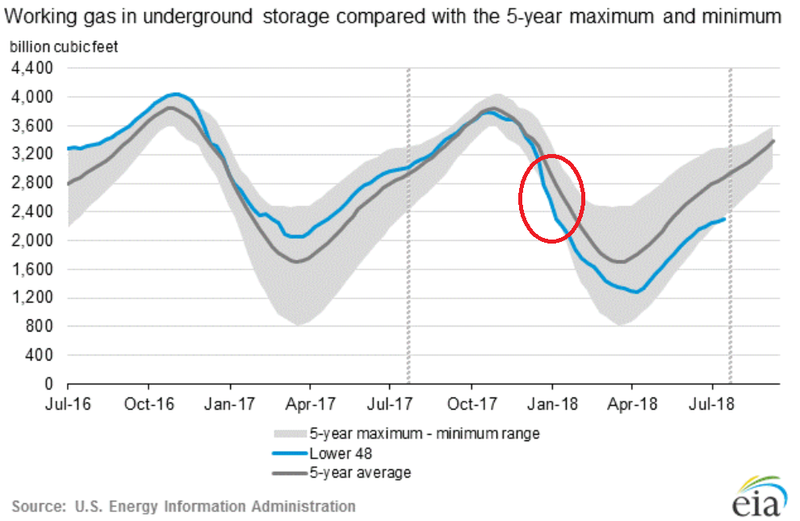 Note how these storage levels correlate with natural gas prices. Following the warm winter in 2012, natural gas spot prices bottomed out a month later at under $2 per million Btu (MMBtu), and they didn’t recover back to the $4/MMBtu level for a full year. But then following the winter of 2014, when inventories ultimately fell to their lowest levels in a decade, natural gas prices spiked briefly above $8/MMBtu, and spent most of 2014 above $4/MMBtu. Now, notice the current status of natural gas inventories as we head toward the high-demand season (which begins about November 1 each year). Seasonal inventories are at the bottom range of the five-year average, and last week they broke slightly below this range. And since U.S. demand has increased by about 8% in the past five years, the current inventory on hand will cover fewer days of demand than it would have at the same point five years ago. Yet natural gas prices do not reflect an elevated supply risk. Natural gas for January and February 2019 delivery is priced barely above $3/MMBtu. 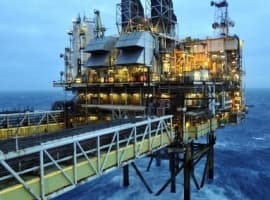 Investors in natural gas futures or in natural gas producers should watch this situation closely, as a disconnect may be developing between natural gas supply risk and price reality. Unless inventories bounce back into the normal range over the next few months, the risk of much higher prices by the end of winter will be significantly higher. Natural gas is currently priced for perfection, with the implicit assumption that production will pick back up enough to prevent supply concerns. There are many risks to this perfection scenario (a cold winter, hiccups in production, increased exports to Mexico) that in my opinion are not sufficiently priced into the market. At what gas price level might we see LNG producers throttle production? It seems this would mitigate against lower inventory levels.